A chandelier is defined as “a branched, ceiling-mounted light fixture with two or more arms bearing lights." During the medieval times, they were made of wooden beams usually shaped as a cross with metal spikes on top to hold candles. It was hoisted towards the ceiling using a rope or chain, and was depended upon as a useful light source. They evolved into more delicate designs involving crystals and stones, and became more apparent in palaces, places of royalty and the wealthy. Today, the chandelier is used in a more decorative way, adding a luxurious presence to the home. - If the room is smaller than 10' by 10', choose a 17" to 20" diameter chandelier. - If the room is about 12' x 12', a 24" to 27" chandelier would be an accurate size. - If the room is about 14' x 14', try a 24" to 36" diameter chandelier. Since a chandelier will be a focus piece in the room, it is vital to choose materials that will enhance the decor of the area. Lavish and visually dazzling light fittings can create the most beautiful kind of lighting. The combination of crystals and candles conjures up all kinds of nostalgic feelings about chandeliers. Crystal and glass fixtures are very popular and represent a romantic sense of wealth. Chandeliers can also come in different metals such as brass, wrought iron, silver and steel. A wrought iron chandelier produces a magnificent appearance. Stone, beads, shell and capiz chandeliers aren’t quite as fancy, but definitely provide a more edgy or whimsical look. 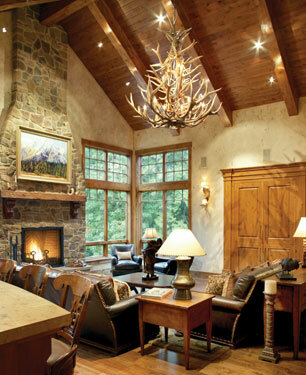 Antler chandeliers from elk or deer embody a rustic style and are perfect for log cabins and rustic lodges. For a room with a traditional style, a fixture with more ornamentation and intricate designs will fit best. Alternatively, a simple chandelier would match a modern style space that is usually less ornamented. A formal and elegant room is best equipped with a very impressive chandelier. A space that features antiqued furniture would be complete with a more detail-enriched chandelier, perhaps with hanging pendants. Another appropriate method to help choose the materials is to begin with a color or element that is influential in the decoration scheme of the room. You want your chandelier color to compliment your existing finishes. Brushed bronze, black, silver or even gold can be neutral tones that will match most decorating schemes. If you already have a warm, rich, wood and earth-toned theme, a bronze or gold finished chandelier may work best. If the room has cool tones, like blues and whites, a silver one would be appropriate. For that sleek, modern style space with black furniture, a silver or black fixture will complement that polished design. For example, a room that is 12 x 15 feet will need bulbs that produce a combined total of 270 watts. A chandelier with 6 bulbs that are 40 watts will most likely provide adequate illumination, especially if complemented by sconces, lamps, or other light fixtures. A more general rule to provide sufficient light with the total wattage of all bulbs is 100 watts to 400 watts. Since chandeliers of recent times are not used as a light source but more as a decorative piece, placing your chandelier on a dimmer is a great option. A dimmer allows adjustment to the light level in order to set the perfect mood. The perfect chandelier in the foyer will create a welcoming atmosphere for all who enter the home. It should provide the general light needed to greet guests and assure a safe passage into your home. When determining whether to hang a flush, semi-flush, or multi-tiered chandelier in your foyer, consider the ceiling height of the foyer and remember to keep it around 7 feet above the floor. For two-story foyers with a window above the front door, center the chandelier so it can be seen from outside. If your foyer is extra-large, you may also want to add matching sconces. They should be installed about 5 feet from the floor and around 6' to 8' apart.